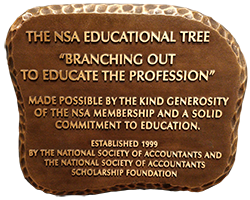 The application window for NSA’s accounting scholarships is open from 1/1/19 through 4/1/19. Interested students should begin applying now. Be a United States or Canadian citizen. Permanent residents are NOT eligible to apply with the exception of applicants from Arizona. Legal residents from Arizona may apply. Be majoring in accounting, having maintained a 3.0 cumulative GPA or higher (on a 4.0 scale). Be an undergraduate enrolled part- or full-time at an accredited (2) two-year or (4) four-year college or university in the United States. Applicants from Arizona must carry a minimum of 9 credit hours. Students in an accredited (2) two-year college may apply following their first semester grades or during their second year if transferring to a (4) four-year institution, provided they are committed to a major in accounting throughout the remainder of their college careers. Students in an accredited (4) four-year college may apply for the scholarship for their second, third, or fourth year of studies, provided they are committed to a major in accounting throughout the remainder of their college careers. Note: High School Seniors or College Students not yet enrolled in an undergraduate accounting program are NOT eligible to receive NSA Scholarship Foundation Awards. Award amounts range from $500 to $2,200. Awards are for undergraduate study only and are not renewable (with exception of the Stanley H. Stearman Award); however, students may reapply each year as long as they continue to meet the eligibility criteria. For more information, download the Scholarship FAQ.